At Mobile World Congress 2013, we announced the winners of the GSMA mWomen Design Challenge, which aimed to aims to redefine the smartphone user experience for resource-poor women in emerging markets. ‘Sahel Shake,’ by Jeremy Canfield, Sarah Fathallah and Angel Kittiyachavalit won the Grand Prize of $20,000 and today we talk to them about their submission. First of all, tell us about the design’s name. ”Sahel” is a transliteration of the Arabic words ساحل referring to the African Sahel region, and سهل meaning “easy”. “Shake” is intended as a wink to Android’s releases named after sugary treats. Why did you enter the GSMA mWomen Design Challenge? We really wanted to explore what could be done to simplify the user interface and make it friendlier to use for resource-poor women in emerging markets. We have all worked at organizations focused on social impact and have worked with mobile, but have not had the opportunity design a mobile operating system from the ground up; the challenge was really exciting and meaningful to us. One of the reasons we entered was that while we regularly work with mobile technology in emerging markets, we never had the chance to challenge the difficulties that came with using a technology with illiterate users. We always had to work with existing user interfaces and find ways to “make it work”. With this challenge, it was invigorating to address the root of the problem and solve it from there, while thinking about the incredible possibilities (even in existing development programs) that would open up. Imagine how much easier things would be to implement if you didn’t have to battle the technology or work around it. Why is your design suitable for resource-poor women? Sahel Shake seeks to alleviate barriers to mobile phone ownership and use for women in low and middle income markets. A phone without battery charge or airtime, far from available top-up credit, is not only useless, it undermines the value proposition of mobile ownership by reducing confidence in the technology and mobile network operator. Sahel Shake gives women control over their phone resources, providing prominent airtime and battery management widgets along with cost-conscious phone sharing and emergency SMS features. Smart phones rely greatly on text input and display, however many potential users cannot use these methods. Drawing from research on interface design for low-literacy contexts, Sahel Shake improves the usability of overly complex phone features, offers an engaging and highly visual contact management system, and integrates voice and icons into SMS entry and delivery. What steps did you take to come to your final design? We started out with a deep dive into the research on illiteracy and mobile phone use. To our surprise, there was already a great deal of literature on the subject and we do want to acknowledge the work of Indrani Medhi, Hendrik Knoche, and Jan Chipchase, among others. For this concept, we mostly relied on our own experiences in emerging markets as well as those of some of our relatives who have dealt with these challenges before. This meant challenging some assumptions about features for a mobile phone. For example, an emergency call button is very useful in the U.S. or other markets with a strong 911 system, but this is not the case in most emerging markets. Our goal was to design Sahel Shake in a way that made users’ lives easier, within the context of their existing environment. This meant simplifying a lot of the confusing options and menus, while also giving the user more control over how much credit they spend on the phone, how the battery is managed, and how the phone is shared. In addition to the literature review, we started out with the Android Ice Cream Sandwich operating system as a starting point for our design. From there, the process was very much a sprint, with the functional specifications and screen layouts built in parallel. Working nights and weekends, we were able to refine the concept and edit down a lot of extraneous operating system features until we were left with something that balanced power and function. What challenges did you overcome in the design process? As a group of three friends who did this on our own time, we didn’t leverage institutional resources to create the concept. This required us to think creatively and rely on our knowledge and experience of mobile behaviors in emerging markets, as well as available research: naturally, this concept will require direct user testing and refinement. The second challenge was finding ways to collaborate remotely with a geographically dispersed team. Angel was based on the West Coast, while Jeremy and Sarah were in New York City. 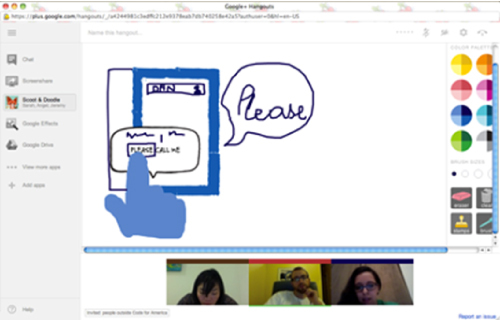 That said, we really came together as a team, divided the work, and used Google Hangouts for team communications (and a bit of fun). What does winning mean to your team? We are very excited to see the reception that the Sahel Shake concept has received. We’d like to thank GSMA mWomen, Ooredoo, USAID and AusAid for giving us the chance to share this design with the attendees of Mobile World Congress, as well as a wider audience. As designers, it is always a privilege to share our work on this type of platform and have the opportunity to bring our work to life. On a more personal level, it feels really good to win this award since Sahel Shake was designed with members of our own family and communities we’ve worked with in mind. Finding potential ways to help them interact with technology and all the opportunities that come with it and being able to say “we understood you” is incredible validation. How do you want to develop the design in the future? In our design, we did our best to ensure that everything was technically feasible based on existing Android capabilities, but it will be important to get feedback from a mobile network operator as well, since they may be dealing with other restrictions or limitations that we are unaware of. From there, we would love to see the concept refined, built, prototyped, and tested in the field. Even if the concept is not implemented as whole that at least a few of the ideas will filter into mobile operating system designs. We believe there is a tremendous opportunity here in bringing the mobile ecosystem to a group that has historically been left out. We would like to thank Daniel Kahn, who contributed thoughtful comments and edits as an advisor to the team. Check back next week to hear from Aloke Pillai, whose design ‘mPower’ won the Second Prize of $10,000. Photo: (l-r) Sarah Fathallah (second from left) and Angel Kittiyachavalit (centre) accept the Grand Prize for their team’s design ‘Sahel Shake’ and are congratulated by Chris Locke, GSMA (left), Cynthia Gordan, Oredoo (second from right) and Maura O’Neill, USAID.